As Pilot has grown and expanded as a company, stations across the country have found it necessary to move to larger facilities to keep up with that growth. The latest station to make their move is Houston, which has moved into a new location, adjacent to the Houston Intercontinental Airport. The new facility features over 18,500 square feet of warehouse space (compared to 9,950 sq. ft. at the old location) and more than 3,000 sq. 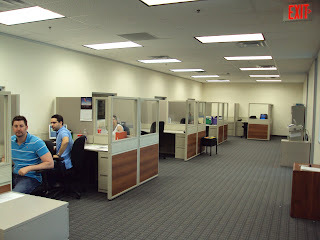 ft. of office space (up from 1,750). I spoke with Brian Nelson, District Manager for the Houston station, who explained that recent growth—in terms of both business and personnel—precipitated this move. Over the past 12 to 15 months, the station has taken on at least five new warehousing customers, whose freight is shipped to the warehouse, where it is inventoried and stored, and eventually shipped out domestically. In addition to obvious advantages of having more space to work with, Brian expressed to me that he is happy to be in a brand new space that is better equipped to host meetings with customers, and to showcase Pilot’s offerings. Congratulations to the team in Houston on the big move!